The Man Booker Prize has been increasingly ‘controversial’ over the years and many claimed that 2011’s shortlist contained several texts that did not quite live up to expectations. First time novelists were the most questioned entries, particularly as veteran Alan Hollinghurst was not included in the shortlist. 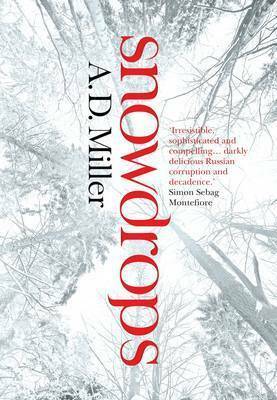 One of these first time novelists was Brit A. D. Miller with Moscow-set thriller Snowdrops. Miller spent several years in Russia as The Economist’s Moscow correspondent and travelled over much of the country and the former Soviet Union. This was obviously the inspiration for his location but one wonders if Miller came across many ‘snowdrops’ during his time in Russia. The Russian slang of the title is defined by the writer as dead bodies that appear as the winter snow melts; and the text opens with main character Nick’s first view of one as the thaw comes in Spring. Nick is a corporate lawyer, working with international businessmen to secure millions of dollars worth of loans for new oil projects in the North. He deals with a man identified only as the Cossack who seems more like a mob boss from a melodramatic thriller than anything else – they are treated to the best of Moscow as the Cossack tries to get his loan and to some extent Nick is swept along by the excitement and glamour of expensive vodka, women and nightclubs. More than anything he seems desperately unhappy living in Moscow and seeks to save himself from depression by indulging in these perks and distancing himself as much as possible from life at home in England, even when he goes back there for Christmas. He meets the alluring and enigmatic Masha and her ‘sister’ Katya on the Metro and pushes himself towards them and into their world, though they seem more than willing to accept him and take him along with them. Nick finds a small amount of happiness in his affair with Masha, but seems to still be unsatisfied. It quickly becomes apparent that he has now left Moscow and returned to London, and his narrative is addressed to his fiancee; perhaps proving that Moscow left him unsatisfied and cold, both physically, and emotionally. He admits that he is recounting his time in Moscow because his fiancee ‘needs’ to hear what happened there and it seems also to redeem himself of his ‘sins’ committed there by telling them all. We do not learn anything of the fiancee and Nick’s attitude towards her is not particularly caring or loving – really he seems to be telling her this sad and disturbing story for entirely his own benefit. This – coupled with his behaviour and actions in Russia – does not at all endear him to the reader, but rather paints him as a continually sad and lonely figure that no one and nothing seems to be able to satisfy. As when the shortlist was announced, I still ponder whether or not this novel was worthy; reading it had not brought me to a conclusion as to whether it should have sat alongside Barnes et al when Hollinghurst did not. What I can say that Snowdrops is simply a thriller/mystery trying way too hard to be thrilling/mysterious. There are moments of literary and dramatic brilliance, but they are mixed together with the most ridiculous moments of cliche – pretty much anything involving the Cossack – and this seriously damages its credibility as a decent international thriller. A. D. Miller has serious potential as a writer, and hopefully his Booker nomination will put enough pressure on him to produce something better than this next time. Snowdrops was published in the UK by Atlantic Books in 2011. Completely agree, didn’t understand the excitement over this one at ALL. Were we meant to be surprising when he gets screwed over?! Surely the fact that it’s hinted alllll the way through is a bit of a giveaway. Some well described scenes but it didn’t do it for me.